1) Over the last few years, 14 terrorist leaders were killed. However, 700 civilians were also killed, meaning for every leader is killed, 50 civilians are killed. That's a 2% accuracy. 2) Our current use of drone warfare is inaccurate, unlawful, and all around damaging to both those being attacked and the attackers. Drone pilot Matt Martin is proof. In one case, he'd carefully aligned a perfect shot on a group of rebels and fired it. However, immediately afterwards, two kids on bicycles rode by, and no matter how much he wanted to stop it, it was impossible. He lives in anguish to this day. 1) Many of the US government's statistics, which say that the number of innocent civilians being killed is very low, are false, inaccurate, or completely corrupt altogether. No matter what source we look at outside of the US government, the civilian count is always much higher than the US's count, obviously showing that the civilian count is indeed higher and that the US have been lying about their data. The New American Foundation, which records the deaths of drone strikes, once recorded a large attack on a building with many people in it, only a few of which were militants. However, all were marked down as militants. A few days later, local reports and findings showed that 26 of the 83 killed were under 15 years of age, which fits under neither the US's definition nor the true definition. 2) A common argument for the use of drones that the government uses that it kills many militants and Al-Qaeda leaders. We have so far killed 14 Al-Qaeda leaders. Even so, news reports about Al-Qaeda bombing or attempting to bomb something still appears on the news extremely often. The Obama administration has revealed an extremely inaccurate way of counting militant and civilian deaths: any male of military age is a militant. 70% of deaths were militant deaths according to the government. Despite being appearing to be extremely significant (enhanced by the media), the death of leaders and leaders is really insignificant. 3) Other warfare kills more- When Israel attacked Hamas with troops, at the behest of the US, the casualty rate was 42%, but when they used drone strikes it rose to 78%. Also, when Pakistan used manned troops, the casualty rate was 34%, but when they used drones it rose to 65%. 1. Drone strikes are immoral and illegal. Drone strikes go completely against the ideas of the US where you are innocent until proven guilty. People are being killed without even being an identified target when bombs are dropped on areas where supposedly suspicious activity has taken place. These are called targeted killings, and they currently happen without being proven as an imminent threat. UN High Commissioner for Human Rights Navi Pillay recently declared that U.S. drone attacks in Pakistan violate the international law principles of proportionality and distinction. Proportionality means that an attack cannot be excessive in relation to the anticipated military advantage sought. Distinction requires that the attack be directed only at a legitimate military target. The US has also ratified the International Covenant on Civil and Political Rights. The ICCPR states: "Every human being has the inherent right to life. This right shall be protected by law. No one shall be arbitrarily deprived of his life." The US government's extreme reluctance to provide details about particular strikes or the targeted killing program in general has impeded much-needed democratic debate about the legality and wisdom of US policies and practices, and stymied understanding about their actual impacts. Clearly, drones do more harm than good. 2. Drones strikes end up killing more citizens than actual terrorists, destroying families and more while decimating the Middle East. In August 2012, the Bureau of Investigative Journalism investigated the history of drone strikes in Pakistan, concluding that there have been credible reports of at least 168 children killed in Pakistan by CIA drone strikes over the past 7 years. This means 44% of civilians killed by the attacks were children, not even beginning to mention the amount of innocent adults killed. A study by Stanford Law School calls for a re-evaluation of the practice, saying the number of "high-level" targets killed as a percentage of total casualties is extremely low -- about 2%. Also, houses are destroyed, and money is lost. A New York University study showed that in fact there is a 2 out of 5 chance that when a drone strikes, a house or building will be damaged. Clearly, drones do more harm than good. 3. Drone strikes, after all the mess has cleared, actually benefit Al-Qaeda and other terrorist groups instead of hurting them. After drone strikes began in Yemen and lasted for a month, AQAP (Al-Qaeda in the Arabian Peninsula) went from a couple hundred members and no territory to a couple thousand members and 3 government territories/provinces. Drone strikes that actually hit Al-Qaeda's leaders only halt Al-Qaeda operations for a few weeks. Its been proven that they continue to get new leaders and new members. In order to properly eliminate the threat, we have to develop benign, local connections and use these connections to end Al-Qaeda by persuading the commonwealth to be on our side, not Al-Qaeda's. Only in this way will Al-Qaeda ever permanently end. Judge, our side has given you a solution to this problem, while my opponents have offered up nothing and are instead arguing to take innocent lives. Clearly, drones do more harm than good. 1) According to a 2010 report by the Campaign for Innocent Victims in Conflict, a Washington-based advocacy group, which was based on fieldwork in Pakistan's tribal areas where all of the drone strikes occur, most residents of the tribal regions believed the strikes are largely accurate and primarily killed militants. 2) In the Obama administration, between 1,507 and 2,438 people have been killed in drone strikes. Of those, 148 to 309, or between 10% and 12%, were civilians, according to the New America Foundation data. 3) In February, The Associated Press conducted a rare on-the-ground investigation of 10 of the deadliest U.S. drone strikes carried out over the previous 18 months. Reporters interviewed about 80 villagers from the areas affected by these 10 strikes and found that of the 194 people reported killed in the attacks, at least 138 were identified as militants. Firstly, we define drones as any unmanned aerial vehicle used in military defense. We define drone strikes as a targeted explosive air strike from a UAV. The United States Congress, as part of the 2012-2013 National Defense Authorization Act will establish Joint Force UAV. This organization will be composed of representatives from CIA, Department of Defense, Department of State and Department of Justice. Targets will be chosen if they represent a serious threat to US national security (for example, members of terrorist organizations like Al-Qaeda). Joint Force UAV, in conjunction with Defense Advanced Research Projects Agency (DARPA), will utilize Advanced Precision Kill Weapon system that are high-precision, low-collateral weapons for deployment with the US UAV fleet. Joint Force UAV will develop targeting protocols and procedures designed to minimize collateral damage. Joint Force UAV will be in compliance with international law, such as the UN charter and the Geneva conventions. Finally, the Joint force UAV will be improved whenever technology is sufficient enough for an update. 1. Drone strikes are the least expensive way to do the job. According to William Galston, it would reduce defense spending in 2022 to $605 billion"which is $100 million less than the military budget for 2013. Defense Secretary Leon Panetta told how the Obama administration plans to achieve $487 billion in cuts over the next decade, in part by reducing the number of ships, planes and troops, but continuing to fund elite special forces -- and support technologies like unmanned drones. Panetta will request a Pentagon budget of $525 billion for fiscal year 2013, a $6 billion reduction from last year's budget and $33 billion less than what had been forecast a few years ago. The administration will also ask for another $88.4 billion to maintain the U.S. troop presence in Afghanistan, a reduction from the $115 billion being spent this year. Also with this money being saved, it will be going elsewhere. This is confirmed by Leon Panetta who told reporters that the impact of the cuts will be far-ranging, "make no mistake, the savings we are proposing will impact all 50 states, and many districts across America." 2. Drones are the most accurate weapons and best option for the job. We need to eliminate terrorists somehow and UAVs are the best possible equipment with which to carry out this mission. All the other options either would result in significantly more casualties or would have other problems that would likely allow terrorists to escape. First there is the collateral damage that would be caused by using other alternatives to striking terrorists. Professor Plaw of the University of Massachusetts says that when terrorists were being confronted by the Pakistani Army, who were attacking at the behest of the United States, 46% of casualties were collateral damage. A similar number of 41% was the figure when Israel was targeting Hamas. When compared to the 16 or 28% collateral damage figures for UAVs the choice should be easy. Moreover other options have other disadvantages. Sending a hit squad in to eliminate terrorists may mean little collateral damage but would cause a diplomatic crisis as it would be tantamount to invading another country. Using a missile or local support on the other hand significantly increases the chances of the target escaping. Pakistan's ISI, military intelligence, has for example been accused of helping the Taliban â€“ they could hardly be trusted to kill them. 3. Fewer innocent and soldiers' lives are lost. There are only two things that really matter when targeting terrorists; is the terrorist eliminated, and is collateral damage kept to a minimum? 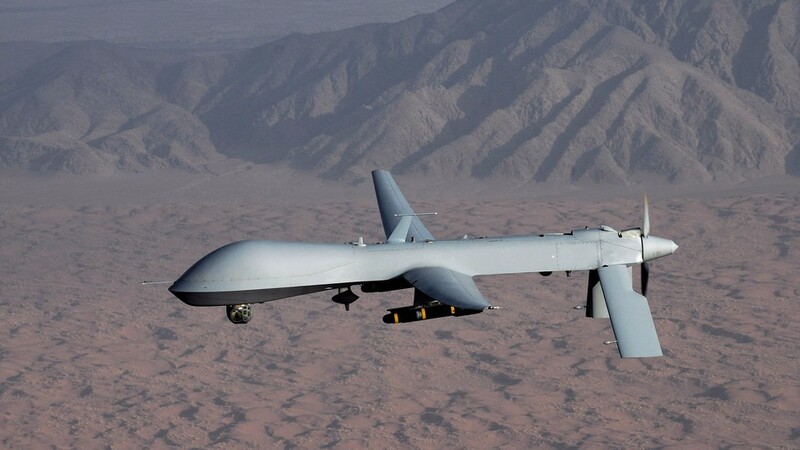 In Pakistan there have been a total of 334 strikes by UAVs between 2004 and June 2012 with the total reported killed at 2496-3202 of which only 482-832 were civilians according to the Bureau of Investigative Journalism. Moreover the number of civilians killed in strikes is falling; 28 percent of casualties in 2008 were civilians but by 2011 this had fallen to 16 percent and this is a figure that is likely to continue falling as drones improve technologically making identification easier and making strikes more precise. These figures show that the United States in its use of drones is not only hitting a lot of terrorist targets and eliminating them but is causing very little collateral damage in comparison to the number of strikes made. With the Army no longer required to be large enough to conduct sustained attacks like it did in Iraq and Afghanistan, it will go down from 45 brigades to 38, part of a planned reduction of 80,000 soldiers from 570,000 to 490,000. The already planned reduction in the number of Marines will be larger than expected as it is reduced in size from 202,000 to 182,000. The reduction in forces for both services will still leave them larger than they were prior to 9/11. The Air Force will lose six of its 60 fighter squadrons -- estimated to be between 108 and 144 aircraft -- as well as 27 of its oldest giant C-5A cargo planes and 65 of the oldest C-130's still flying. Seven Navy cruisers and two amphibious ships will be retired early.